Brexit and the European Parliament elections in May— these are the two hot topics in Europe right now and this is what AUBG students, professors and guest lecturers discussed during the annual Political Science (POS) week on campus March 4-8. 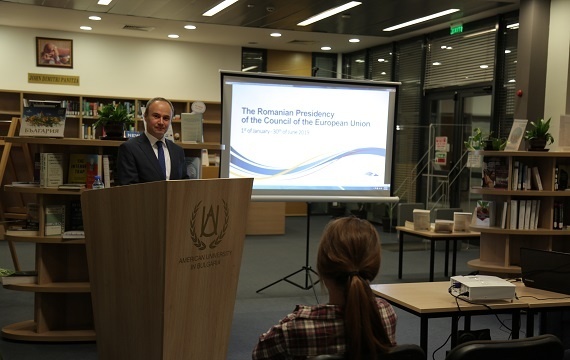 Jointly organized by the AUBG Political Science Club and the Department of Political Science and European Studies, the week-long event featured talks by Ambassador of Romania to Bulgaria H.E. Ion Galea and Hristo Hristov, Deputy Head of European Commission Representation in Bulgaria, as well as a webinar with Doru Frantescu, CEO of VoteWatch Europe. Galea spoke about the priorities of the Presidency of the Council of the European Union that Austria handed to Romania this January. “When you study Politics and European Studies, it is good to have a take from practitioners that deal with very concrete issues,” said Jean Crombois, AUBG Professor in Politics and European Studies. “This way the students can make the connection between theory and practice.” Every year, Crombois and the students from the EU Lobbying Class go on a trip to Brussels where they visit the EU institutions and meet with AUBG alumni, politicians, and practitioners. Next on the agenda was the webinar with Doru Frantescu, CEO of VoteWatch Europe- a think tank in Brussels that provides analysis and forecasts on EU affairs. Frantescu described the methodology behind the organization’s data gathering process and talked about the possible outcomes of the European Parliament elections in May. Magdalena Bernaciak, AUBG Professor in Politics and European Studies, believes that it is crucial for students to have a continued exchange with professionals in the field of politics. “The VoteWatchEurope CEO even encouraged students to have an internship with the organization,” she said. 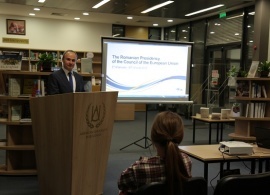 Hristo Hristov, Deputy Head of European Commission Representation in Bulgaria, gave a lecture on the impact that the possible Brexit scenarios could have on EU citizens and EU students in particular. “A no deal Brexit, for example, would make it harder and much more expensive for young people to study in Britain,” Crombois said. In addition to the two talks and the webinar, the week-long event also featured a documentary screening and an EU simulation game. Following POS week, the Danish ambassador to Bulgaria also visited AUBG March 14 and the students are currently getting ready to host the annual Model European Union Conference March 29.